« kpkpkpkpkpkp… what? A who where underlying what memory in mammals? 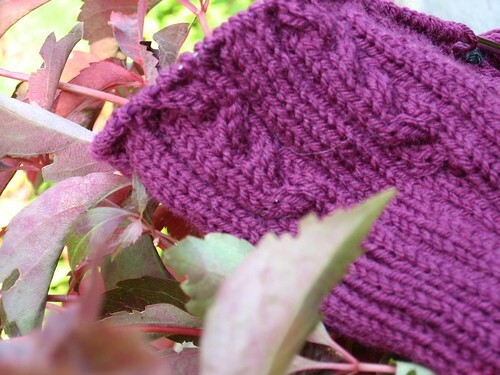 I decided that I would never seam it unless I had a leg-up, so I decided to knit the bottom part in the round and throw in a slipped-stitch fake seam on each side to keep the shape a little bit. I’m not sure about this cast-on, though. 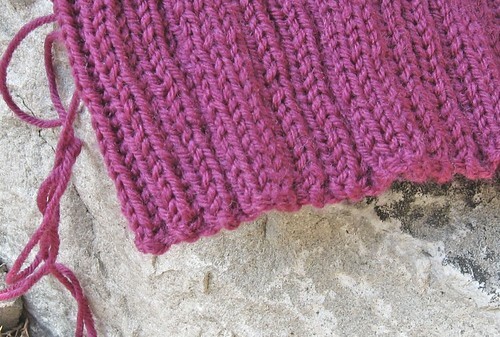 I think I might pull it out at the end and do some sort of sewn bind-off. Any recommendations? 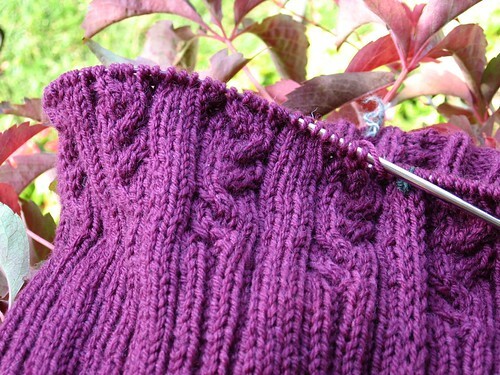 I’m close to the end of the second ball, so the yarn here is a slight jumble. No worries, it’s a manageable jumble. I just like the way it looks poking out from under the sweater, so I took a picture. And an all-over shot to see what the whole thing looks like. 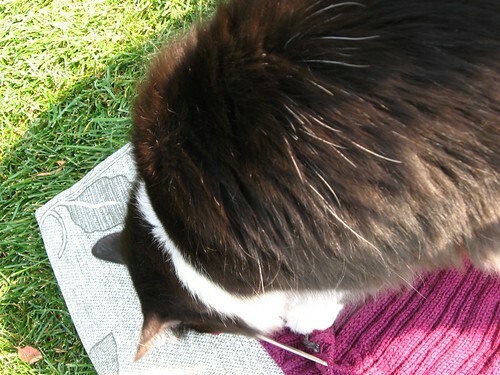 Aw look, Pounce is sniffing my knitting! Aw how cute. Aw, how… oh no! She’s eating my knitting! Stop! No! Kitty, bad kitty! Stop! Why am I still taking pictures?! 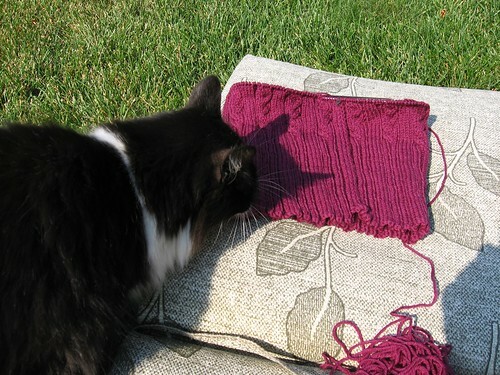 LOL at the yarn/sweater eating cat! I love your editorial style. I hate double posting, but realized I forgot to mention, I’ve fallen out of love with every cast-on that I’ve done lately. Mostly, I use the twisted-German cast-on (also known as the long-tail cast-on) for the stretch, but it is so not pretty. 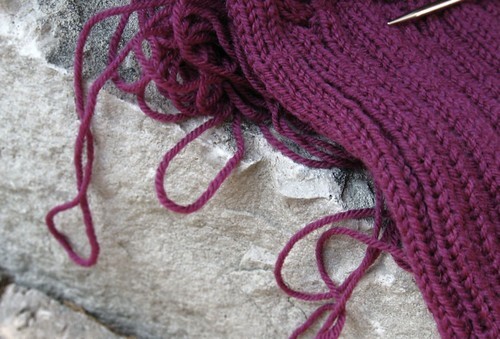 What is this sewn bind off you speak of? 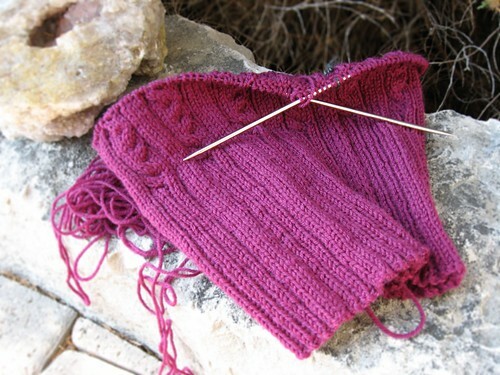 And how do you undo your cast on row to pick up stitches? This I have not tried! It might solve my current distaste for most cast-ons. Do you have a favorite cast-on/cast-off? Or do you use different methods based on what you’re making? 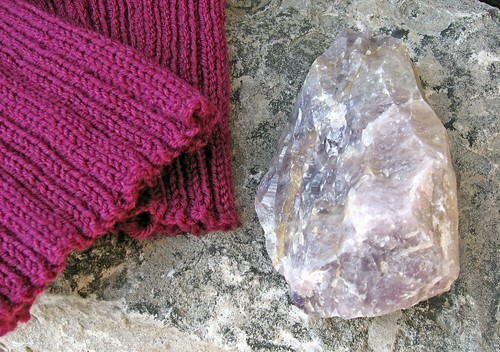 I find it’s best to cater your cast-on to what you’re knitting. I usually use the same cast-on as you do (the german twisted business), but I don’t really like it unless I’m doing stockinette, and even then it’s a bit iffy! I’m the same as you, I’ve fallen out of love with every cast-on I’ve tried. I used to like tubular cast-ons, but they’re not stretchy at all so I’ve given up on them as well. There’s a special cast-on that grumperina talked about at one point that’s like a tubular cast-on but stretchier, but unfortunately she didn’t include instructions! So I’ll have to keep searching for a better cast-on. 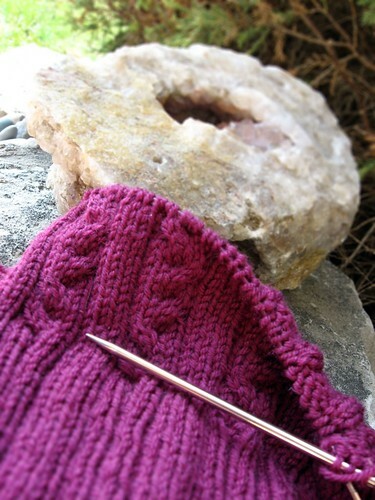 The sewn bind off is something I heard about but haven’t attempted yet. It was popularized by Elizabeth Zimmermann, I think. 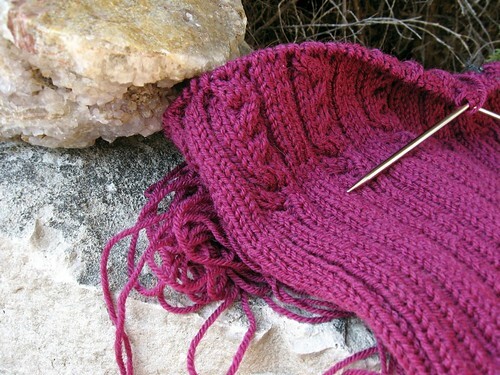 If you google “sewn bind off Elizabeth Zimmermann” you’ll probably find a few links or two. This entry was posted on October 5th, 2007 at 3:26 pm and is filed under Colchique, In Progress. You can follow any responses to this entry through the RSS 2.0 feed. Both comments and pings are currently closed.